To sign up to the NewcastleGateshead Newsletter, simply click the Request Newsletter button below and you will receive amazing special offers, discounts and access to secret sales. NewcastleGateshead is the vibrant capital of North East England where famously friendly residents and the iconic Angel of the North are waiting to welcome you with open arms. Sign up to the newsletter today to get the latest offers and news on everything in the area. The Quayside area is packed with cultural venues and is the perfect place to admire some of the seven bridges that span the river including the famous Tyne Bridge. Make sure you visit international home for music, Sage Gateshead, which was designed by famous architects Foster + Partners, who also designed the dome of the Reichstag in Berlin. The medieval castle that gave the city its name – now known as Newcastle Castle – is a must see. Visitors can explore the Castle Keep and Black Gate to discover the city’s ancient heritage. Newcastle is world-famous for its Brown Ale, but now many craft breweries have sprung up in the region, offering a wide range of authentic local ales. Visitors can settle down for a pint that has been brewed on site in The Bridge Tavern’s own micro-brewery, or visit Wylam Brewery’s spectacular home in the Palace of Arts in Exhibition Park. With an exciting restaurant scene, there’s so many choices for places that offer seasonal and locally-sourced dishes, including Michelin-star House of Tides or Blackfriars, which is the oldest dining hall in the UK. And famed for its nightlife, the city has an abundance of traditional pubs, cocktail bars and nightclubs to choose from for after dinner drinks. 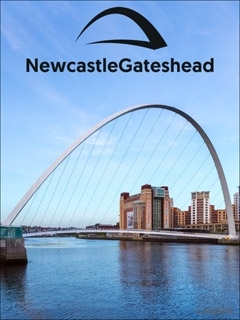 Sign up to the NewcastleGateshead newsletter today for inspiration on your Geordie city break! By Pressing the Request Newsletter button you give NewcastleGateshead (and their Data Processors for the specific purpose of delivering your emails) consent to send you their newsletter via email until such time as you choose to unsubscribe.